A Doctor Who special will be the first screening at Bradford's disused Odeon cinema for 17 years. The Doctor Who Christmas special, Twice Upon a Time, stars Peter Capaldi with David Bradley as the First Doctor. The old cinema will host two separate showings exclusively for fans who won tickets in a BBC ballot. Film expert David Wison, of Bradford Unesco City of Film, said Friday's screening would be a "big day for the building". He said the Doctor Who team chose the unlikely venue because they wanted "interesting spaces" for screenings. Almost half of the chosen audience of 600 will be from Bradford postcodes, BBC organisers said. The former Odeon cinema is being rebuilt as a 4,000-capacity music and events venue in a £15m restoration project and will be run by the NEC group. Lee Craven of Bradford Live, the body behind the redevelopment, said: "People will have to walk through some of the original 1930s building via the restaurant to get to the bingo hall to watch the screening." He described the cinema as "derelict chic" and "almost a time machine with the building having gone through all sorts of reincarnations". "People will be surprised how good a condition it is in", added Mr Craven. The city centre cinema opened in 1930, was converted into three smaller cinemas and a bingo hall in 1969 and has been derelict since closing in 2000. 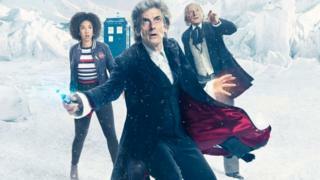 Twice Upon a Time, which will be shown on BBC One on Christmas Day, also has Pearl Mackie returning as Bill, the Doctor's companion, and guest star Mark Gatiss as the Captain. Mr Wilson, who is to attend the screenings, said the audience would be facing the same stage The Beatles had appeared on. As for the special screening it was "almost as through we are drawing back a dusty, velvet curtain, blowing off the dust and stepping into Narnia", he added. Other venues chosen to host special screenings of the special include St Nicholas Cathedral in Newcastle, Durham School and Hartlepool Town Hall.